Located on a lively stretch of Phra Ong Dam, P1 is run by a stylish group of young Thais who cater both to domestic and foreign travellers. Average rating 7.6 from 407 reviews. Reached via a lift and accessed with keycards, rooms are absolutely smashing for the price, with a mix of hardwood or tile floors, soft lamps, rattan and silk accents, polished cement and modern appliances in the hot-water bathrooms. Standards are of a decent size but a bit dark, while the larger superiors are very bright thanks not only to more natural light but also light green walls and glossy white tiling on the floors. All rooms are immaculate and equipped with wall-mounted LCD TVs, desks, mini-fridges and firm beds. While there are no dorms, the vibe feels more like a boutique hostel than a traditional guesthouse, so it’s no surprise that the sign outside says, "Hostel". On the ground floor, a lounge/bar/restaurant/coffee shop spreads over several rooms and out on to a garden patio out back. Vintage sofas, bicycles and low-key live music accompany a billiards table and some good food, coffee and other beverages. 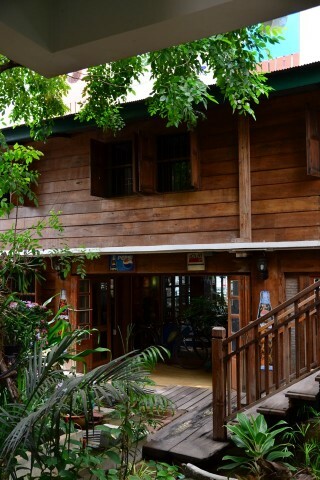 The staff members we met were welcoming, and the rooms cost half of what they would if in Bangkok or Chiang Mai. The location puts you a 10- to 20-minute walk from the train station and key historical sites but within earshot of the night market. P1 has no website but can be booked through some of the booking sites. Recommended. Check rates at P1 House on Booking.com.